The statement got me to thinking about my past experiences as a digital marketer and more recently as a consultant. It is very clear now: marketing technology is not just a gimmicky, shiny object-driven part of the marketing ecosystem. It is a mission-critical function no matter what size company you are. Marketing automation has been around for over a decade. Multimedia web content management and social media are closing in on two decades. The marketing technology discussion is not a new one; it has officially crossed the chasm. Look at the famous Brinker MarTech slide – this is the standard for categorization of the landscape (I like to call them “buckets of logos). If you are seeking answers, this chart is not the place to go. Look no further than IT – a group that has been using roadmaps and “sprints” for a while now. It’s time Marketing applies this methodology to its mad dash to acquire technology, data, and new capabilities. 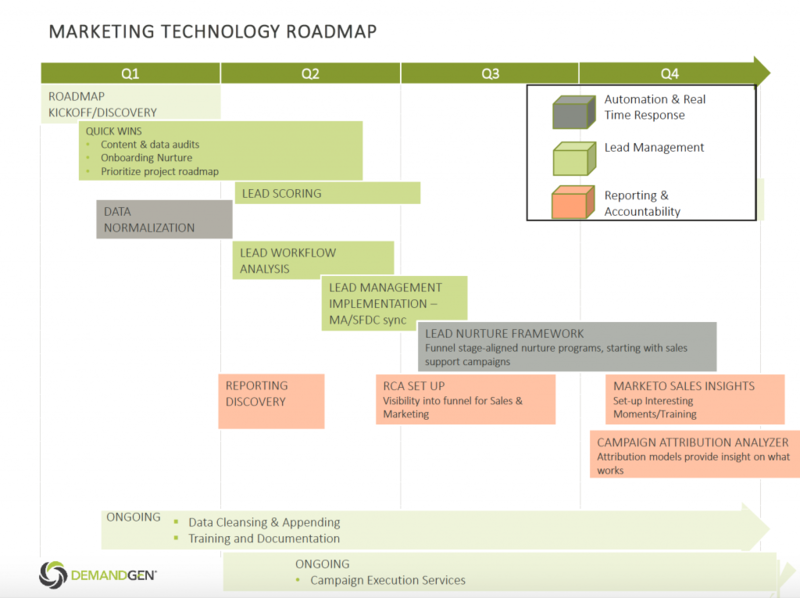 What I would recommend is building out a 1-3 year marketing technology roadmap. Marketing automation – The decision management capabilities and responsibilities for MA continue to grow across the board. Media and software services now sync with MA and integrate offsite behavioral data and trigger remarketing/retargeting across multiple channels. There is a new advancement or utilization every day. Website – Most clients have some internal conflict over who owns the website and the cross channel/cross business demands that come with ownership. Companies are leaning on marketing partners to build programs that they can’t accomplish internally: for example, website personalization, progressive profiling or innovative conversion strategies. Real-time decision management and sophisticated propensity models will complicate an already messy corporate property. Marketing Analytics Dashboard (AKA what you can do with the data you have access to) – You can’t talk about marketing and the technology that empowers it without discussing measurement. This is the most disparate category across my client base. While some are just scratching the surface with campaign reporting frameworks, many others are doing advanced analytics and have multi-tenant BI/data visualization solutions. Wherever you are on your journey, this should be a foundational element of your MarTech stack. Build the construct for your technology ecosystem; notice in the example above that many strategic projects rely on other technologies and processes being in place first. Categorize what you might grow and what you might sunset. The data quandary – most marketers are buying lots of data. Are all systems maximizing this investment? Is it useful? Define organizational structure and responsibilities. DemandGen has been providing this guidance to clients for almost 10 years and has a validated methodology to building this out for clients. If you decide to do it yourself, make sure you scope it out over a 1-year, 2-year or 3-year period and focus on the dependencies of the four foundational technologies. At minimum, the exercise will be eye-opening. More than likely, it will transform the business and advance your career.